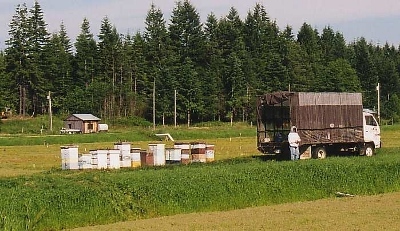 Flying Dutchman on Vancouver Island provides all your honey bee pollination needs. We provide honey bee hives for your orchard, blueberry fields, cranberry bogs and pumpkin patches. Our hives are placed in your fields at the optimum time to start pollinating your crops and removed when the flowers are finished. With honey bee pollination your crop will be ready earlier, be bigger and you will have more of a yield than if you relied on the natural pollination. Flying Dutchman became a little larger close to the mid nineties when we purchased a beekeeper out in Black Creek. We went from being the proud owner of about 50 hives to over 200 hives and started our first year providing hives for Commercial Pollination. Harvesting cranberries on Iron River Cranberry Farm is shown in this picture. 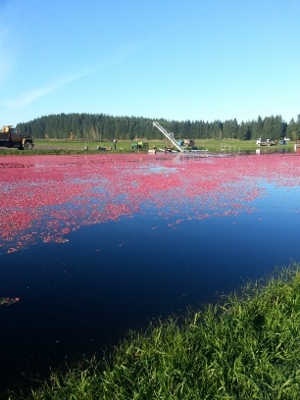 This is one of the largest cranberry bogs on Vancouver Island. We provide about 175 plus hives for pollination in this bog, plus we also provide hives for five other bogs. Our services have been used at Iron River Cranberry Farm since the about 1995 and as they have grown we have also increased our production of bees and haves to where we will probably be providing close to 500 hives just for cranberries on the Island.